In honor of Canada Day, I thought I'd pay tribute to one of the most iconic Canadian symbols and a design classic - The Hudson's Bay Blanket. 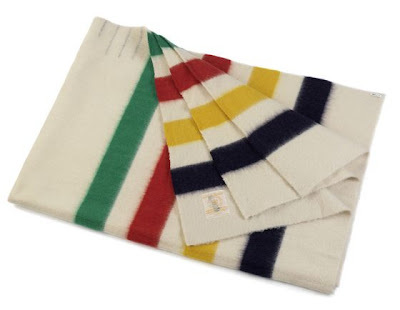 As it says on The Bay's website, "the Hudson’s Bay Traditional Point Blanket has been around since 1779 when the first 500 sample blankets were created. It is known the world around for outstanding craftsmanship, luxurious texture, superior warmth and long lasting beauty." You really can't go wrong with the traditional point blanket - it's a classic for a reason - but the new color options are quite nice as well. Check them out here.